From the moment it begins, the feeling that The Best Exotic Marigold Hotel is not going to contain too many surprises becomes apparent. Accentuated as the film progresses, its affectionate charm also starts to grow on you. The bright optimistic approach is appropriate, given that this is most definitely a fantasy. But despite the fact it’s idealized, the film generally manages to steer clear of clichés, and makes for an enjoyable viewing experience. The characters are introduced with brief but coherent backstories. There is Evelyn (Judi Dench, who also narrates throughout), a recently widowed woman who is plagued with problems of her late husband’s debt. Graham (Tom Wilkinson) is searching for a long lost love, quitting his job to return to India after some 40 years. Douglas (Bill Nighy) and Jean (Penelope Wilton) are a married couple who make the trip to try and add some spark into their mundane lives. Madge (Celia Imrie) and Norman (Ronald Pickup) are two old singles hoping to feel young again. And finally, Muriel (Maggie Smith) is a wheelchair bound xenophobe, who swallows her pride and comes to India for a hip replacement that can be offered to her immediately there. With their motives set out, the group travel to Jaipur, India, where they are immediately taken aback by how different everything is. 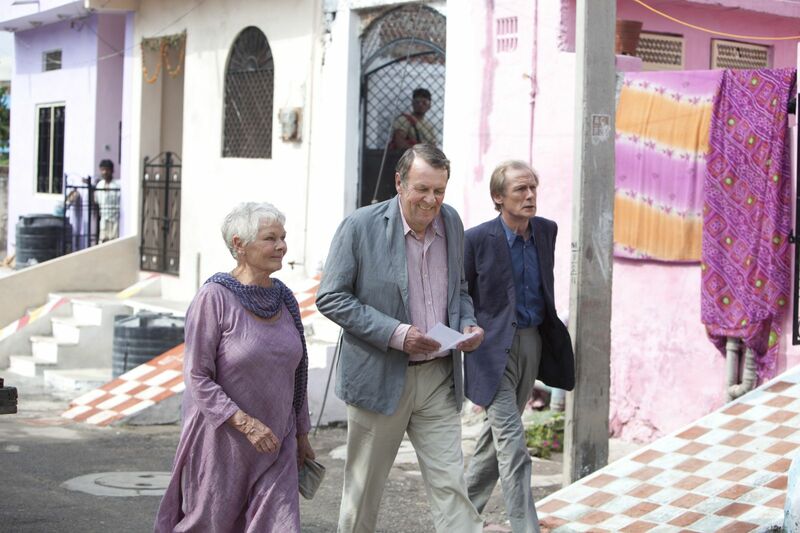 After travelling along some rather hectic roads, they finally arrive at the Marigold Hotel of the title, a supposedly exotic haven for elderly people. However, when they reach it, they find it is in a state of dilapidation, and not at all what the brochure promised. They reluctantly enter, where they meet Sonny (Dev Patel), the irrepressibly enthusiastic young hotel manager who is just about the polar opposite of a pragmatic individual. Although they are initially reluctant, Sonny’s ever optimistic attitude and the vibrant ambience of Jaipur begin to win the tourists over in different ways. Muriel is the most fiercely opposed of them all, but she even eventually finds a new lease of life, forming a touching, if unbelievable, relationship with one of the “untouchables.” In fact, none of the various different plot strands really ring true, but that’s not the point. This film isn’t trying to be realistic, and it wouldn’t succeed if that is the direction it headed. Director John Madden (Shakespeare in Love, The Debt) has assembled a cast of some of the most experienced and talented actors in Britain. Wilkinson, Nighy and Dench stand out in particular, giving performances that pack a real emotional punch. 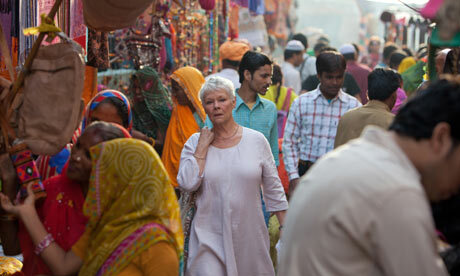 Judi Dench can convey a whole wealth of puzzled depth with just a look. With lesser performances, the film might have slipped into a mawkish self-indulgence. And the actors not only give great performances, but they play off each other very well too. The comedy can feel a little heavy handed at times, and it comes off sporadically, but there are plenty of laughs to be found. Thankfully, the humour employed is generally of a more gentle nature, and doesn’t try to play the jokes too hard. The drama is quite potent and moving, and the film has several serious notes. However, overall, this is a light-hearted feature with humour being the main objective. As Sonny frequently states, “Everything will be alright in the end… if it’s not alright then it’s not yet the end.” And this is a message that the film takes to heart very strongly. Madden employs very colourful cinematography to bring out the vibrant hustle and bustle of Jaipur, painting a very vivid and evocative picture. A substantial portion of the film is shot in the streets, making the city less like a scenic backdrop, and more like an integral character of the story, as the sense that this is the 2nd most populous nation on the planet is expertly captured. In one scene, the camera focuses on a large bird gracefully floating through the sky for a good 10 seconds. Although this moment is fleeting, it is a section in which one truly appreciate the elegance Madden has delivered. Considering the source material of children author Deborah Moggach, it is not altogether surprising that the film veers substantially towards sentimentality. Even if everything is wrapped up very neatly, the affability of the characters and good-natured charm of the story click together so amiably that you don’t really mind. You might not discover yourself or gain a new outlook on life, as the characters miraculously do, but it is a warm-hearted and good natured film that doesn’t require much from the viewer. 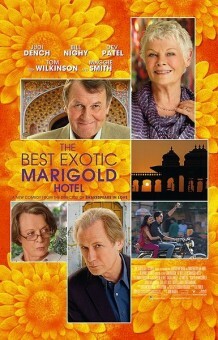 The Best Exotic Marigold Hotel is currently in release in the UK and will hit US theaters on May 4th.